Yesterday I bought the iMac and the iOS version of your product. 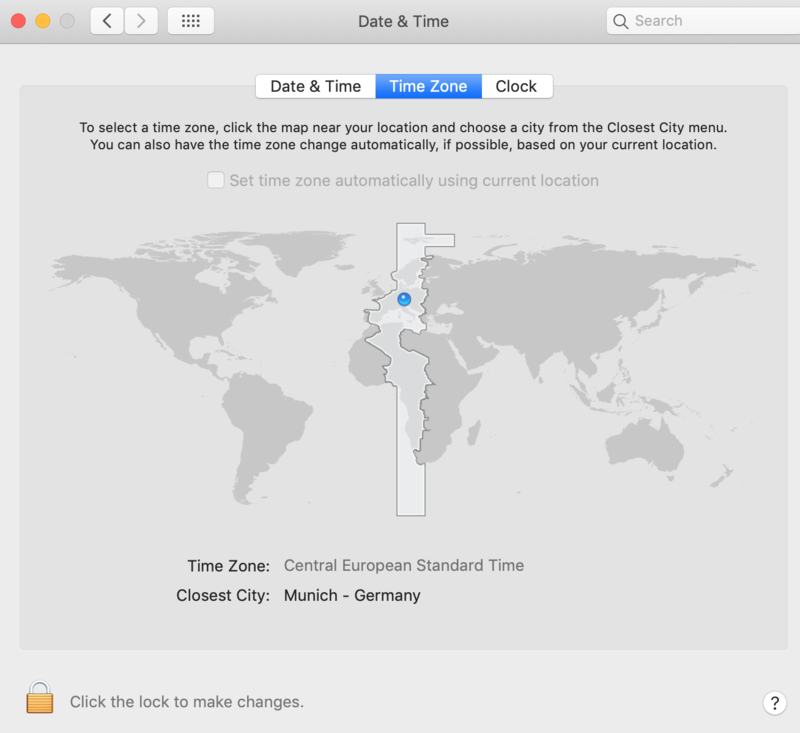 Whereas on the iPhone everything works fine, it seems to me like the iMac version is working with the wrong timezone. It is 09:00 CET and I am not able to work on today. Today is even not "coloured", but still "in the future". Please let me know how to solve this. Or this is product only made to work in the USA? Thank you very much for purchasing Timelime! Timelime should definitely work in any timezone. 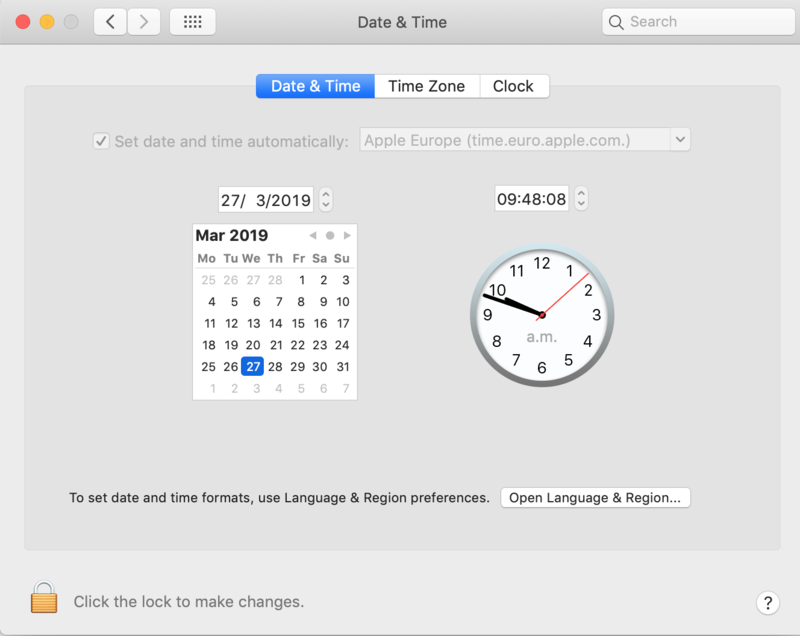 Can you please check in macOS System Preferences > Date & Time if “Set date and time automatically” is checked and the timezone is set to “Central European Standard Time" like in the attached screenshots. All settings are exactly like you show. And by the way: We are talking about manually adding an entry. And when I tried this on the iPhone as I could not find a way on my Mac, the program synchronised and today now is available on my Mac. By manually adding a timing on the Mac, you mean adding a timing by right-clicking on a task and choosing “Add Timing” in the contextual menu. When you start the timer in the menu bar, the timing shows up correctly on the 27th? I choose one of my tasks on the left (I have three projects: black, red, green) and highlight the one I would like to work on. Then I use the + button in the third section under „Timings" at the bottom. So a new action appears here on top. This morning I was not able to choose 27th - only max. 26th. This led to my idea if there is a problem with the timezone. But let’s wait until tomorrow - maybe something got stuck because of the Mac OS Update yesterday. In case it works tomorrow morning I send you a confirmation - otherwise I ask for more support. And besides this: I love this tool. It is exactly what I need to record my activities in my new home-office! In the date picker (middle column of the main window) you have only March 25 and 26 selected (custom selection). Then you hit the “+” button in the third column. In this case the new timing is created for March 26, as it would not be visible in the timings list if it was created on the 27th. In general I would recommend using the timer to record your time while working. You can right-click on the menu bar item to start and stop the timer for recent tasks. - You can drag and drop a task from the right column on the desired day of the date picker. - In the task list of the menu bar panel and the main window, you can select a select a task and the hit cmd+t to add a timing. Just a short note to let you know that after re-booting my Mac everything works fine! Ok cool! Thanks for letting me know.